Goodreads Summary: After siphoning her own blood magic in the showdown at Hubal, Opal Cowan has lost her powers. She can no longer create glass magic. More, she’s immune to the effects of magic. Opal is now an outsider looking in, spying through the glass on those with the powers she once had, powers that make a difference in the world. As much as I really liked Spy Glass, I think it’s my least favorite book in the series. Opal’s powers are gone, and she now has to adjust to life without them. There is a way for her to regain her powers, through some of her blood that’s been stolen. And blood magic. Damn blood magic. There really is no escaping it, is there? She does go off on her own to figure things out, and with the help of Valek- plus a few others- she gets her blood back in a totally interesting way. I was not expecting that at all. I liked that Opal learned who she could trust, and that she has a really good friend in Valek. I really liked seeing him without Yelena (although I like them together too) because I feel like we get a slightly different side of him. I was quite surprised by the romance. Not completely surprised, because it really was headed towards a Devlen/Opal relationship, and not the Kade/Opal relationship. Even though Kade and Opal wouldn’t have worked as a couple in the long-run, part of me still likes them as a couple a lot more than Devlen and Opal. 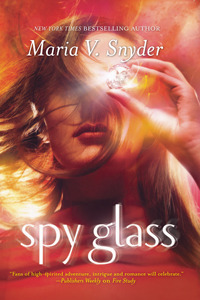 I really liked Spy Glass, but I can’t, for the life of me, pinpoint why I’m not completely in love with it. Maybe it’s because I love how Opal uses magic so much that her without it was hard to get used to. It’s a really good end to the series, but I just had a harder time getting into it, and for reasons unknown to me, I just didn’t like Opal as much in this one. To be honest, I really liked it, and I have no clue why…I just do. I really liked Spy Glass but can’t pinpoint the reasons why I like it. However, Opal without her magic for a good chunk of the book was a little strange. I just couldn’t get into it the way I got into the first two books. Spy Glass gets 4 stars. This is another series that I’ve looked at a million times but never been convinced by. Maybe it’s time I actually gave this a shot! I really love this series! I definitely recommend it!